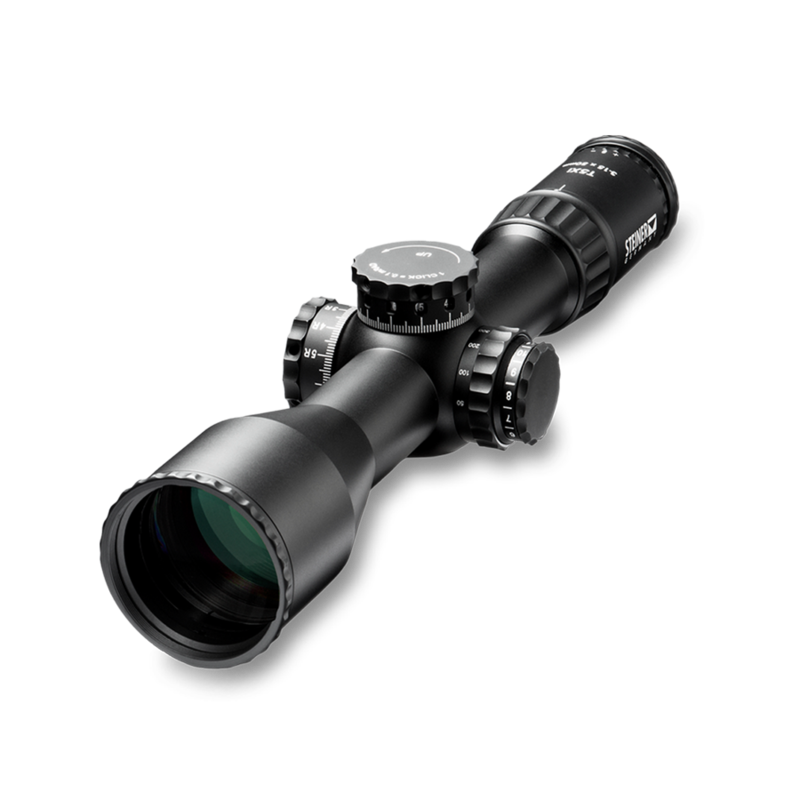 The T5Xi Series brings unmatched clarity, accuracy and self-assurance to any situation, from combat to competition. Precise German engineering, rugged U.S. construction, slick Never-Lost™ turrets, and SCR™ or Horus H59 reticle gives you the victor's edge in close-quarter battle, mid and long-range shooting. Medium range scope with 34mm tube, illuminated etched glass, front focal plane and second rotation Indicator that shows each mll of elevation through the indication window on the elevation turret. a Steiner exclusive, that shows each mil of elevation trough the indication window on the elevation turret. After the first revolution of 120 clicks, the mil numbers scale change automatically preventing the shooter from getting lost on the dial. designed by Steiner for precision competition use. Located on the first focal plane, it offers an extended illumination area, 2/10-mil windage and 1/2-mil holdover lines. 1/10-mil ranging brackets allow for precise distance ranging. Licensed from HorusVision, the H59™ reticle is a "field-tuned" version of the H58. They widened the horizontal grid by one mil for increased wind holdover, and the center cross has been turned into a "broken cross" so groupings are less obscured and more easily seen. is angled so the shooter can see his magnification setting while positioned directly behind the scope. for positive, non-slip adjustment of the diopter, reticle and parallax settings. that prevents accidental rotation of the diopter. and a generous eye box throughout the magnification range eliminates the need to reposition your eye when changing magnification. that allow quick, easy magnification changes and Tenebraex covers protect the lenses from dust and moisture. Field of View at 100 yds. Windage Range at 100 m.